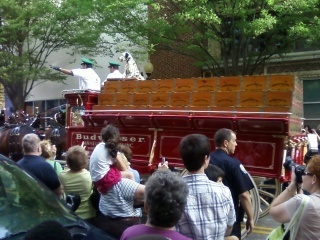 The Anheuser-Busch Clydesdales came to Winston-Salem on April 19 and I got to see them! My mom told me that she saw them when they came to Philadelphia, in 1976 for a bicentennial celebration. 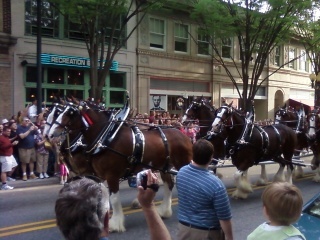 I feel privileged and proud that the horses came to see me! Just kidding! I'm not that conceited. 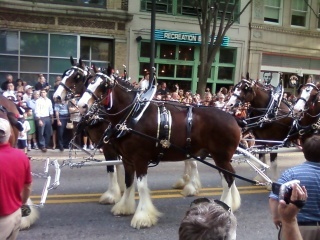 In the video below, the horses are bobbing their heads in time with music that was being played. It's amazing, but these gargantuan equines actually look cute in their stance. Turn down your volume because it was windy that day and all you can hear is he wind whipping past the speakers. And it's quite loud. The beer wagon (complete with faux cases of beer) pulled away from Recreation Billiards, just as it did on a another tour 62 years ago. There is a framed photo inside this pool hall turned tavern, a place full of Winston-Salem history.